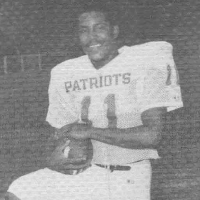 One of the most electrifying athletes in school history, Willie Hicks thrilled the entire CCHS community as the quarterback of the great football teams of the mid-1980's. A native of Roxbury, Hicks came to the Concord school system through the METCO program as a freshman in the fall of 1983. It didn't take coach Al Robichaud long to notice Hicks' talent as a passer and runner, and the veteran mentor installed him as the starter midway through his sophomore season. With Hicks throwing and exciting wideouts like Mike Tobin, Mike Duggan, Nick Boynton, and Geoff Zentz on the receiving end of Robichaud's "flying circus: ' the Patriots went on to post a 19-6 record in two-plus seasons, including wins over perennial powers Xaverian and Malden Catholic. Close losses to DCL rival Lincoln-Sudbury (which featured two future NFL players) in 1985 and '86 denied C-C its first trip to the Super Bowl since 1978. All told, Hicks ended his high school career with over 4,500 yards and 51 touchdowns for his career, both school records. A two-time DCL All-Star and team MVP, Hicks was tabbed by both the Boston Globe and Boston Herald as Eastern Mass. Player of the Year and was named a high school All-American following his senior season. Also a standout basketbaII player, Hicks was a two-year starter at guard for coach John McNarnara. One of the most recruited high school quarterbacks in the country, Hicks spumed scholarship offers from national powers like Nebraska and Syracuse to play for coach Jack Bicknell and the hometown Boston College Eagles. His career got off to a remarkable start as a freshman when he came off the bench to throw for over 300 yards and lead the Eagles to a near victory in front of 80,000 hostile observers at Ohio State. Hicks went on to earn a starting role for the Eagles and enjoyed a successful college career. "Anyone who ever saw Willie Hicks play football knew what a special player he was:' said former Patriot coach Robichaud. "He was a very accurate passer and was elusive as a runner. It was a fun time to be coaching because he was such a remarkably talented player." Following graduation Hicks worked for the Big East Conference before assuming the position of Vice President with the family business, Hicks Auto Body. Willie is also the Chairman and CEO of jrwear.com, a children's clothing company. 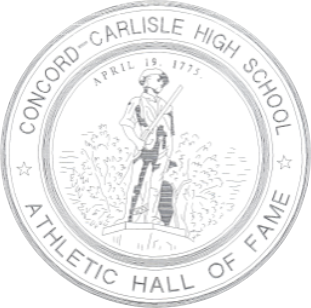 "I am happy to have had the chance to compete with friends who were also teammates at Concord-Carlisle: ' said Hicks, who stays active playing golf, tennis basketball and running. "The support from the students, parents, faculty and staff in the towns of Concord, Carlisle and everyone from the METCO program made my experience very special. I would most of all like to thank my family for all of their support and love over the years." Hicks resides in Randolph, Massachusetts with wife Kathleen Harris-Hicks and six-year old daughter Jazz Lesoleil.